Nicole delivers an exceptional lesson experience and ranks in the top 15% of our teachers nationwide. Nicole B., Soprano/Musician is soprano soloist for the premiere band of the U.S. Army, "Pershing's Own". Nicole has her Masters of Music from CSU, Northridge while actively working as a professional vocalist for groups like the Verdi Chorus, St. Luke's Episcopal, St. Mark's Presbyterian and playing countless roles in opera's and musicals across the states and overseas. Nicole has had a lifetime involvement in voice, theatre, songwriting and music and is also currently lead singer and flutist for local D.C. Based rock band, Strum the Fox. Nicole has also worked in the pop industry with the four girl pop group "Women of Wealth" based out of Montecito, CA and featured on KEYT with guest star John Cleese. Coming from a family of artists and musicians, Nicole has always found the art within live performance to be the inspiration for her life and her career. Melding artist expression with technical ability, Nicole's talents and passion make her a performer and teacher with the ability to bridge honest and natural acting skills with a powerful and studied classical voice! Throughout her life, Nicole has found herself pursuing classical voice, rock music and theatrical performance with a drive and passion that surprises even those who know her well. Her students have included parents and children alike as she has opened the door for many to pursue their life-long passions, she also is experienced in and loves teaching and working with special needs students. All of my lessons are tailored to the interest of the student! Although I come from a strict technical background, I believe that the love of music and performance comes from experimenting and being creative! In a lesson with me, I suggest repertoire but if something is not working it is never a problem to redirect and find the right path for the student! With the wealth of my experience having been in over 45 musicals, opera's and other productions I can teach and guide the student through any performance and musical interest they may have and bridge the gap between genre's that so many are unable to do. Living Room, computer, keyboard, couch. I expect the students to provide a piano and or instrument of choice, and purchase method books and other repertoire. I am expert in any type of vocal style, as I have an extensive background in musical theatre, pop as well as opera. I also have a great ability to teach Music Theory, something I love and something I do very well at. Like I said previously I have been in over 45 musical theatre/straight theatre and Opera productions, so I can teach acting as well as performance. I have also written over 50 songs for guitar and voice and performed with a local band in Santa Barbara, CA , so I have a lot of experience as a songwriter and guitar and can teach those as well too. 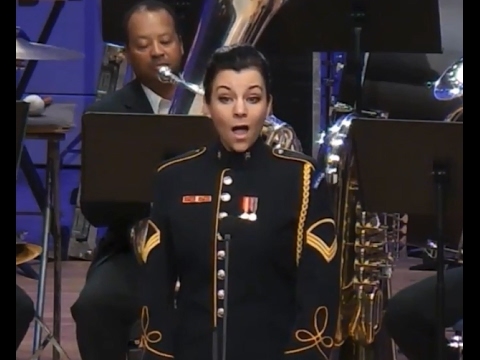 US Army Band "Pershing's Own"
Soloist for The Verdi Chorus, based out of Santa Monica, CA. My daughter loves working with Nicole! I am so grateful we found her. Professional, reliable and extremely talented. Most of all, inspiring to my child. We are lucky to have found her!!! Around a year ago, my daughter decided she wanted to learn to play the guitar! Thanks to Google, we ran into TakeLessons. Nicole was recommended to us. After reading about her we were quite impressed! Right after the first lesson and to my surprise, my (very shy) daughter had a great 1st experience with Nicole. Nicole is a professional in her field AND also in handling kids and knowing how to help them overcome their shyness. She brings out the best in my daughter and also encourages her to sing even write her own notes! I would highly recommend Nicole. She is truly talented and the greatest teacher!!! Nicole,is amazing with my daughter. She is patient and really makes her feel at ease. I will absolutely recommend her.